Autocorrect is a useful feature for those of us who often make mistakes when typing messages. After all, it corrects misspelled words. However, predictive text (another name for autocorrect) also proves annoying when you type in multiple languages. Moreover, sometimes, it corrects words and phrases that you don’t want to be corrected. In this article, we explain how to turn off autocorrect on iPhone, iPad, and iPod Touch. Before we begin, it is important to understand that when you disable the autocorrect feature on your iOS device, it turns it off everywhere. For example, it no longer works in messages, Facebook comments, Notes, etc. Hence, you need to decide how important spelling and grammar are to you before you disable autocorrect. Then, tap the switch next to Auto-Correction. Auto-Correction is off when the switch is grey. An image showing where to find autocorrect settings on iPhone. Now, the next time you use your iPhone’s keyboard, Apple’s Auto-Correction feature ought not to correct spelling nor grammar. 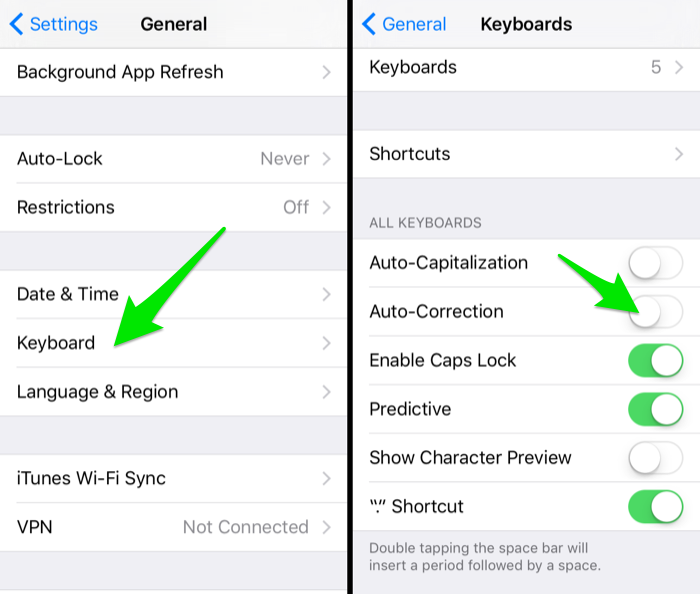 However, if you decide to turn on Autocorrect on your iPhone once again, here’s what to do. Once more, open your iPhone’s Settings app. Then, scroll to the keyboard option and tap it. Lastly, tap the toggle next to Auto-correction to enable the feature. Autocorrection is enabled when the switch is green. What To Do When I Cannot Connect To iTunes Store? Why Can’t I Connect To The App Store? How To Enable Apple ID When Your Apple ID Has Been Disabled? What To Do When “iMessage Waiting For Activation” Freezes? Do you type in different languages? Then, autocorrect can provide better text replacement for your desired language. However, you must add these languages to your iPhone’s dictionary. Firstly, Go to Settings -> General -> Dictionary. Then, add French and Spanish (or your preferred language). You can go to Settings -> General -> Keyboards. Here, you can add multilingual keyboards. To add a text replacement, tap the plus symbol then enter your phrase and shortcut. To remove a text replacement, tap Edit, tap the minus symbol, then tap Delete. How Do I Pair Apple TV To Remote? Can I Play GameBoy Advance Games On iPhone? How Do I Turn On Spell Check On My iPhone? To find spell check on your iPhone, go to Settings → General → Keyboard. From this menu, you can also enable or disable other keyboard features that, such as auto-capitalization, autocorrect, and spell check. How Do You Turn On Predictive Text On iPhone? Firstly, open your iPhone’s Settings menu. Then, tap on “General,” then “Keyboard”. Here, you can turn on and turn predictive text off. Likewise, you can press and hold the keyboard icon (the smiley face to the left of the microphone icon) at the bottom-left of your iPhone’s keyboard. A shortcut to toggle predictive text on and off appears when you do so. Why Won’t My iPhone Turn On? Try This Fix. What To Do When My iPhone Touch Screen Is Not Working? Why Is My iPhone Not Ringing And How To Fix It? How Do I Make Ringtones On An iPhone?